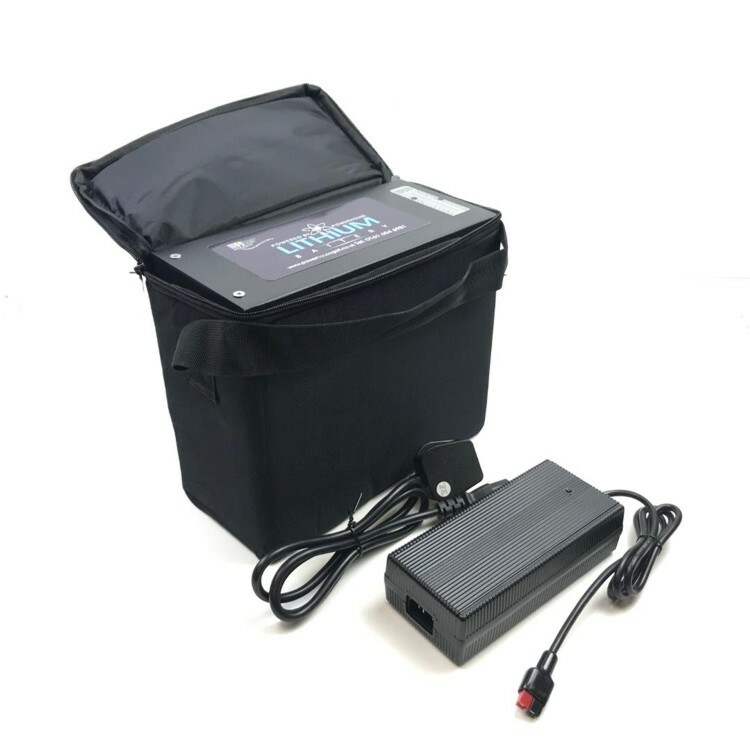 The 18-27 Hole (210A) Lithium Golf Buggy Battery is designed especially to fit within the battery bay of the Powerhouse Pro range of single seat Golf buggies but can also be used on all makes and models of single seat buggies using a 24V system. Simple modification to wiring may be required (Supplied). It weighs in at 7.2kg and measures (W)125mm x (L)260mm x (H)220mm, As there is only one lithium battery required the weight saving when compared to two 80ah lead acid batteries is a massive 45kg or around 9 stone. The Lithium Battery is supplied fully protected by a sophisticated specially designed battery management system that constantly monitors every cell to ensure the lithium battery is always optimised for best performance and life. Charging is also quicker, a flat battery will charge in around 8hrs and the lithium battery comes supplied with its own lithium charger. Remember you only need 1 battery. It replaces the 2 standard lead acid batteries on your buggy. Size: >! ((W)125mm x (L)260mm x (H)220mm ! !<Applications: Suitable for use with the Powerhouse Golf buggies. Life expectancy*: in access of 1000 Cycles, unconditional. Duration: 18+ hole capacity depending on terrain and conditions. Features: Ultra Light High performance. Complete with Lithium Charger. Warranty: This battery comes 2 years manufacturers guarantee. Usage: Can be used anyway around as it is non spilable. Must be stored in charged condition. 24 months from date of purchase, charger has 12 months. Available to the 1st purchaser or user. VAT Exemption is available on this battery. Conditions apply, please ask for details. It is our intention to supply a product that provides and gives faultless service during its lifetime. However, from time to time things can go wrong. You battery is shipped as standard with a full comprehensive warranty as explained on the "Warranty tab". *However, should your battery develop a fault and needs to be returned to us, it can only be shipped using a carrier company certified to do so, and not Royal Mail. The current price of this service to send and return is £14.99. The "Additional Transport Warranty" covers this return/redelivery for 2 years. We do not expect the battery to fail, but in the event of it doing so, everything is covered. Just notify us and we will do the rest. If you dont want to take the transport warranty, just simply untick the box just below the price on the product page, and continue to checkout. Note* This option covers UK mailnland only.